In addition to nuisance animal removal, I also include Black Bear Control and Prevention methods of black bears that might be a problem or nuisance to you. I continue to hear stories about bears that have become brave enough to walk right up on back porches, front porches, carports, barns, and just about anywhere they want. They get into garbage cans, eat dog food, cat food, stored corn, and whatever can be found to eat. I hear stories about how they have destroyed bee hives. We all know we can't shoot them, trap them, or snare them, since they are protected, but there are other means of control and prevention. So if you have bear problems, and want to keep them away from your home , call me and we can work on control and prevention methods only. Black bear fur is usually an uniform color except for a brown muzzle and light markings that sometimes appear on their chests. Eastern populations are usually black in color while western populations often show brown, cinnamon, and blond coloration in addition to black. 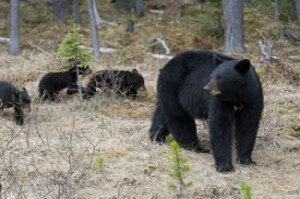 Black bears with white-bluish fur are known as Kermode or glacier bears and these unique color phases are only found in coastal British Columbia, Canada.